Juju was seated on the edge of the bathtub, watching her mother get ready to go to the rodeo. The mist of Aqua Net hairspray rained down upon her and she instantly felt green. Juju was six and puking was kind of a hobby for her. The placebo her mother had garnished from Dr. Bulloch had worked for her 1st grade, nervous tummy spewing. This was different though, she felt really sick this time. Yes, she was sick!! The only thing she had allowed herself to eat that day was an entire bag of jelly beans. Dare she tell her family? Tonight was the annual pilgrimage to the Fort Worth Fat Stock Show and Rodeo. The night they all dined on big slabs of beef, as other forms of the animal were chased and roped below them on the arena floor. Juju took a deep breath and continued to watch the bouffant form above her, she tapped her toe to the Johnny Cash song playing on the radio. They all loaded up in the Cadillac for the twenty-minute ride to Fort Worth and the Will Rogers Coliseum. The steakhouse had a glass wall and sat high up on one end of the arena. Reservations were impossible to get, but Juju’s father was a chef and worked the food service at the Stock Show every year…everyone knew him. The best table in the joint, front and center was awaiting Juju’s family. She sat in the backseat in her blue jeans and jacket, tan cowboy hat, and red Justin boots. The motion of the car had her head swimming. The bouffant was driving, her father was in the front passenger seat, Juju was surrounded by sisters…and nausea. The family took their seats, the rodeo started, and smiles were all around. High dollar meals were ordered, even Juju was getting a Texas T-Bone on this night…with french fries and ketchup please!! Besides Christmas, the Stock Show was pretty darn special for Juju’s family. Her father had been associated with it for thirty years…it was a source of income and pride for him. This was his night to show off his family and indulge in a special meal, one he didn’t have to prepare. The plates hit the table and all the smells wafted under Juju’s nose. What she had been holding back for over an hour let loose. People packed into the restaurant looked on in horror as the little cowgirl did her best to imitate Yellowstone’s mighty blow. Juju’s mother grabbed the collar of her jacket and drug her to the restroom. Not one person in the place was spared from the spectacle. Juju left a trail across the dining hall, as all eyes left the bull riding to see her mother, Jewel, jerk her quickly away…it was surely more than eight seconds. Juju’s parents settled down in the living room, back to their usual, the TV. Her sisters went their own way too. Juju put on her pajamas, bummed she had not gotten to see the entire rodeo. Jewel and Jim turned their heads to the loud crunching at the same time, their hunger having left them for at least a day. Juju sat alone on the couch, chomping happily, diving into an open box of Frosted Flakes…her red boots dangling off the edge. The bright, flickering light of the console TV lit the room, the Bonanza opening theme began to play. The bouffant turned to her and smiled lovingly. Juju smiled back and thought….it must have been the Aqua Net. Grab your Duds, it’s Fat Stock Show Time! The Fort Worth Fat Stock Show and Exposition has been going strong since 1896. It is the country’s oldest continual running stock show and rodeo. We are quite proud of it here in Cowtown, it helps define us as a city. Fort Worth has been known as “Cowtown” since the post-Civil War days when cowboys stopped in for supplies here on their way to the Chisholm Trail. All natives of my hometown have stories to tell surrounding the Stock Show and their families, what follows just happens to be mine. My father was a chef, I have blogged about that before today. From his post-WWII years until about 1971 he worked for a company called Coburn Catering, they were a multi-faceted organization. He supervised the food service at General Dynamics in Fort Worth, a major defense contractor, for Coburn. That was his full-time job, but for 24 days a year he worked at the Stock Show. Coburn Catering was responsible for all the food stands at the Show, along with a major daily buffet at the “Round Up Inn” building on the complex. My father’s name was James…but the people that he supervised and all his friends called him “Bill,” the first four letters of his last name. Bill had one special job each year at the Stock Show. He prepared a dinner for the guest of honor at the rodeo. Now this was a big deal for big Bill and he relished the attention it brought to him. The likes of Gene Autry, Roy Rogers and Dale Evans had played the arena in their heyday. About the time I was old enough to put on my own chaps they had Jeannie C. Riley, Tanya Tucker, and Roy Clark hitting center stage. Jeannie C. Riley was famous for singing “Harper Valley PTA.” I hate the song now, but as a six-year old in 1968, it made me tap my toes. My sister Junene and I memorized the song and were often called upon to entertain guests at our house. Picture two kids dressed up in their best cowboy duds, singing about adultery and drinking. With the cloud of cigarette smoke above our heads, I am sure our living room did resemble a honky-tonk. But anyway…I digress, there were top country stars coming through Cowtown, and my father, a Yankee was feeding them! Every year we grabbed our duds and traveled down to the Show. I usually had on a pair of Wranglers and boots, leather vest, and of course, a real cowboy hat. 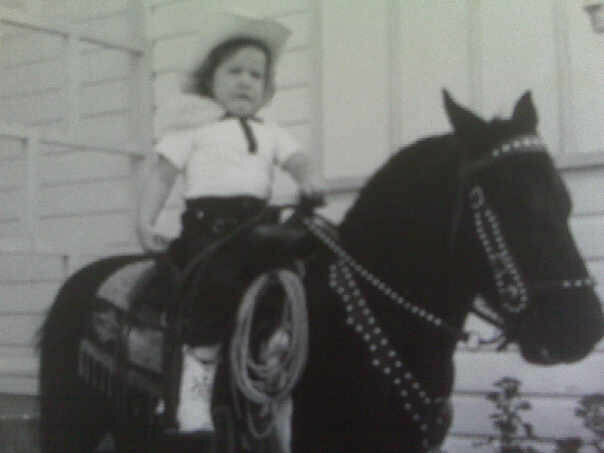 My father actually wanted me to dress in frilly cowgirl skirts and boots…but what he got was a kid who looked like she stepped off the set of a TV western. One year I dressed up as a squaw girl, but most of the time the little queer girl in me was ecstatic with my outfit. I had two silver six-shooters and a holster slung low on my hips. The guns fired caps, although the Show always required you to bring your guns empty so as not to disturb the horses. I got to meet some famous people, but the only one that I remember was Jimmy Durante. He was a famous actor and singer, known for his big nose…he called it his “Schnozzola.” I remember him because he was my father’s favorite of all the people he served over the years. My father cooked Durante a huge Texas T-bone steak with all the fixin’s. He liked to tell the story of how the actor praised the meal over and over…and even sang him a little part of a song. He sang “Inka Dinka Doo” to his personal chef…his trademark song…it was a great compliment to my father…one he never forgot. Every time the actor was on the TV…for the rest of my father’s life, I had to hear the story about the steak dinner and the solo serenade. The people that worked under my father in the food preparation were mostly Hispanic. They would play the card game “Spades” on long catering tables on their breaks. In between chasing bank robbers through the poultry and swine barns, I would take my breaks with the workers. One of the men would say, “here comes Bill’s little Sheriff, let her sit in for a hand or two!” I would holster the six-shooters and sit a spell with the workers…in my mind I was in a saloon playing Texas Hold’em in Dodge City. Gunsmoke was my father’s favorite TV show. Ken Curtis, the actor that played “Festus” had been at the Stock Show the previous year. He was the comic relief of the show…I pictured myself more the Matt Dillon type…heroic and an excellent shot. Little wonder why I grew up to be a cop…I had already patrolled the cattle barns for years. I called my father a “Yankee” as did everyone else that knew of his origins. A Yankee, to a Texan, is basically anyone that was born north of the Red River. Believe me, that was kept on the down low at the Stock Show. My father had lived in Texas for over twenty years, so he had learned to slow his speech and he sprinkled his conversation with “Texanisms” so as not to get busted. 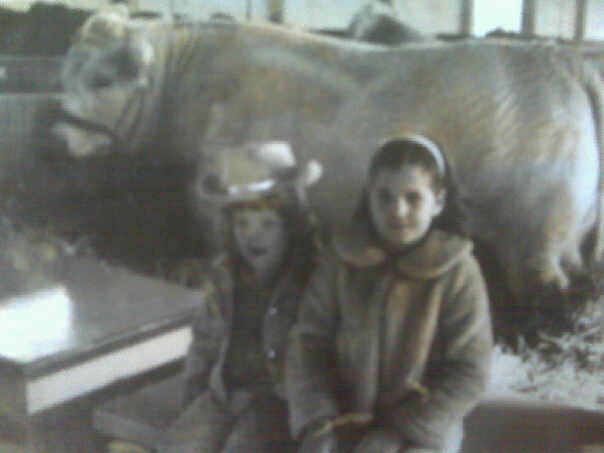 The Stock Show was about as country and redneck as you can imagine…assimiliation was a survival skill. I will give you an example of a Texanism: “Damn y’all, that was like kissing your sister, I tell you what…” Translation: That was second-best, not really good at all. The “I tell you what” part leads you to think perhaps that something else is coming…but not. It is merely an affirmation of what preceded the phrase in the sentence. My father couldn’t speak Spanish, but he did speak Texan and that was good enough for him to converse with his workers…good enough for him to work undetected in Cowtown. The Stock Show has a section of rides and games beside the rodeo arena, much like any carnival you might have seen. Turns out Sheriff Matt Dillon was known to love cotton candy, often downing that and maybe a funnel cake before hitting the Carousel. I would mount my steed and envision myself galloping into the sunset in search of Miss Kitty.